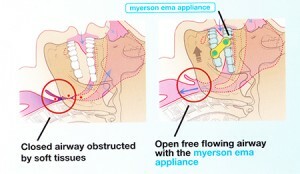 The Myerson EMA is a custom-made, removable appliance created to treat snoring and obstructive sleep apnea (OSA). The appliance is designed to give the sleeper highly improved airflow during sleep. 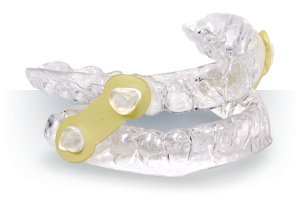 EMA appliances provide the sleeper with a deeper and much more restful sleep by preventing snoring and relieving the symptoms of obstructive sleep apnea (OSA). Even if the sleeper has congested nasal passages, the EMA will maintain generous airflow for the sleeper. 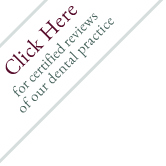 One thing that patients constantly comment on is the comfort of the appliance. Because the EMA is not a one-piece, rigid piece of plastic but, rather, uses flexible bands to open the airway, the sleeper can move their jaw side to side. In addition, the EMA is one of the lightest and thinnest appliances available today.